Anna Kendrick was seen as she walked the carpet at the 2015 AFI Awards Luncheon held at the Four Seasons Hotel at Beverly Hills on Friday afternoon January 9 in Los Angeles. The star actress wore a not too flattering for her body Honor Spring 2015 White Paper Candy Tweed and Pearl Embellished blouse and skirt while she paired up with a Sophia Webster Coco Pumps in Flamingo Rainbow. 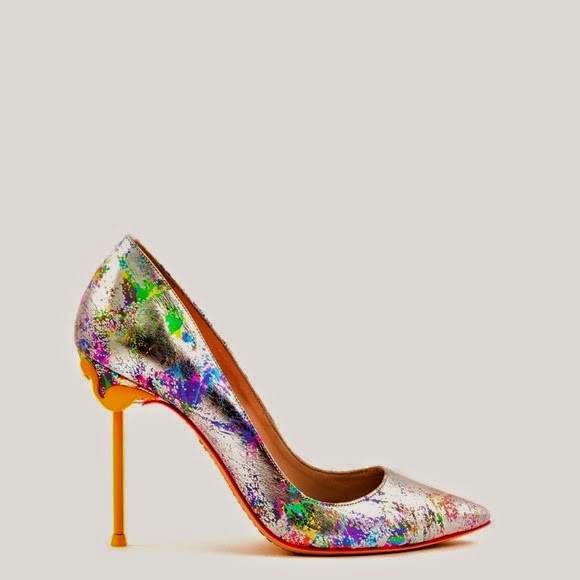 These beautiful pumps features a metallic rainbow print silver patent leather, pointed-toe and 100mm orange stiletto heel. Sophia shoes are known to be playful yet chic and girly.. Check out Elizabeth Banks in same pumps.Her outfit didn't do her body type type justice but am happy she used this gorgeous heels to up her game cos the whole essence of putting on beautiful shoes is for it to compliment your outfit. You can purchase her shoes at Sophia Webster and other plain colored coco pumps at Sophia Webster.